To view 15 more pictures, interactive maps and the full, detailed description of the Elizabeth Place community, please Login. A nod to the well-known Elizabeth River, Elizabeth Place is a community that lives up the inspirational figure for which the river is named after. The famous royal was admired for her beauty and charm, and the homes built by Wirth Development Corporation embody the same characteristics. The landscape surrounding Elizabeth Place inspires its residents to enjoy the simple luxuries such as nature, water, and peaceful living. This eco-friendly community will feature single-family homes, with 6 homes overlooking the river. In addition to the Elizabeth River backdrop, residents are able to enjoy walking trails. The floorplans capture natural light and the beauty of nature by having an open, yet functional use of space. Sophisticated craftsmanship is displayed in the smallest of details, including crown molding, high ceilings, recessed lighting, and granite kitchen countertops. Tranquil living awaits you at Elizabeth Place. Residents have the convenience of a private boat dock from which they can navigate the Elizabeth River by boat, kayak, or stand-up paddleboard. 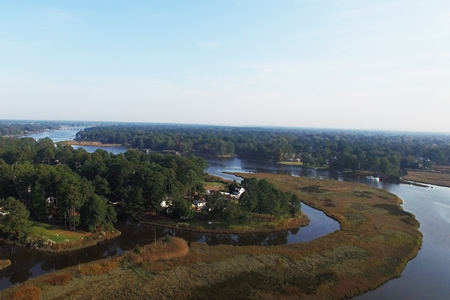 Nautical adventures lie ahead for those who wish to explore the Elizabeth River and beyond through Atlantic Intracoastal Waterway. For boat enthusiasts, Elizabeth Place is the perfect distance inland to ensure protection from storms, while having quick accessibility to travel up the James River, the Chesapeake Bay, and beyond. Located in the Western Branch area of Chesapeake, Virginia, Elizabeth Place is a tranquil escape from the city while still being closely located to shopping, military bases, hospitals, and other area attractions. Chesapeake is known best for the big city conveniences with small town sharm. Despite Chesapeake being large in size and population, small-town values prevail everyday. Send me more information about the Elizabeth Place new home community. Our agents gladly offer FREE property tours of Elizabeth Place, Chesapeake and homebuyer consultations to all serious buyers.